With Star Trek: New Frontier: The Returned, Book 2, Peter David's latest New Frontier epic gets well underway, leaving drydock and heading out, as it were, where no man (from our universe) has gone before. Between this and the first installment of the three-book ebook series, I found the former stronger, with Excalibur Captain Mackenzie Calhoun and company together, some of them for the first time in a while. Book 2 offered more twists but fewer surprises, with events proceeding essentially as one might expect. Also, with one book left, it's increasingly tough to figure how David will bring the book's disparate storylines together. Maybe that's better than the resolution being obvious, but two-thirds of the way through, the audience wants perhaps a better sense of the plot coalescing; the concern, of course, is that with no more New Frontier guaranteed, Returned might end on a cliffhanger instead of conclusively, leaving the audience with the same trouble as after Blind Man's Bluff. Again, I can see why David would want to leave the audience wanting more, but I'm going to want more anyway and I'd as soon do so without having to wonder where David is going with the side-plots. That side-plot is, namely, Robin Lefler and Mark McHenry holding court on New Thallon, and the prime minister who wants to dispose Lefler and her son having recruited the Thallonian god "the Awesome," newly revealed as Q. I can imagine Calhoun in the next book, fresh from angering super-powerful aliens in another universe, being chased back to our universe by the aliens and needing to recruit Q to stop them. Personally, I'm not much a fan of Q, and especially in Star Trek literature, acting as a plot device to do whatever the author needs him to (and David, especially, has visited the Q well enough that another Q appearance in New Frontier hardly raises an eyebrow). But Q and Calhoun matching wits in the third "Returned" book is again a poor best case scenario. The alternative is that Lefler and McHenry's struggle on New Thallon should have nothing to do with Calhoun and the alien Dayan, and these storylines remain separate or Lefler and McHenry's story isn't even resolved by the end. This has been David's custom so far -- Lefler's story has been slowly unfolding since 2004's After the Fall, related to but rarely the main focus of the Excalibur's adventures. For a shining moment in Returned, Book 1, David had former shipmates Lefler, McHenry, and Soleta all back on the Excalibur, a true "returned" aspect of the book, and it's disappointing to see two of those characters sidelined so quickly. The long-lost McHenry's return, specifically, was the surprise that won Returned, Book 1, and I'm sorry not to see him interacting more with the Excalibur crew. Without the promise of the reunited crew, I also found the second book's main plot predictable. David has Calhoun entering another universe to take revenge on the D'myurj, a race that themselves wiped out Calhoun's species, the Xenexians. Given any other leading Starfleet captain, it would be a forgone conclusion that they'd be somehow convinced not to commit genocide before the end (as Picard did not wipe out the Borg in "I, Borg," for instance), and only a slightly better chance in New Frontier because Calhoun is a novels-first character. But as soon as Calhoun meets the Dayan, aliens obviously evil despite their boisterous presentation, it's clear Calhoun will side with the better angels of Star Trek nature and not, at least, take an active part in the D'myurj's destruction. Notable for Calhoun's character development is that he essentially talks himself off of his bad path without needing to be convinced, per usual, by his wife and colleague, now-Admiral Shelby, but at the point early on in which David introduces Calhoun's very bad foils in the Dayan, the rest is essentially telegraphed. Calhoun does not even get to beat to death the most villainous of the D'myurj, called the Visionary, but rather he's stopped by head of security/ship's counselor Zak Kebron. Obviously beating a prisoner to death isn't conduct becoming of a Starfleet officer, but New Frontier has historically a wild west aesthetic, no less recently than when Captain Kat Mueller killed a murderous politician on New Thallon in Missing in Action. To an extent, Calhoun does everything right in Returned even as the audience pants for him to do something a little wrong; neither do we have a sense that Calhoun will cheat on Shelby with the enamored Soleta, even as monogamy has traditionally been fluid in New Frontier. 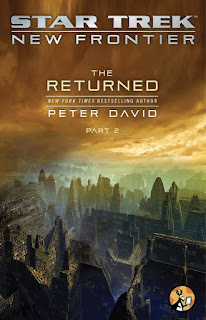 Returned, Book 1, with Calhoun trying to jump into the Guardian of Forever, hints at the kind of transgression New Frontier is known for, but the second part is mostly by the book; I'm hoping for much more risk-taking in David's conclusion. There's a moment in Star Trek: New Frontier: The Returned, Book 2 in which the Dayan find out the Excalibur is perhaps betraying them by harboring a D'myurj ... when the ship's doctor blurts it out over Calhoun's combadge with the Dayan in the room. It's something that certainly could happen within the confines of the Star Trek world, but it's such a silly moment, hardly befitting what are supposed to be trained professionals, that it took me out of the story (as if Calhoun might not say "One moment" while meeting with the Dayan, or route his messages through his first officer or such). That is, in some ways, this second book: perfectly functional, by-the-rules Trek, but not the cleverness I'm expecting from New Frontier. My fervent hope is that, were the three-part Returned actually one whole book, this would be the passable middle before a truly stellar finale to come.